I am here to teach the best way to roast a spaghetti squash. It wasn’t until three years ago I discovered this little gem of a squash…and I was supper eager to try it as a replacement to noodles. 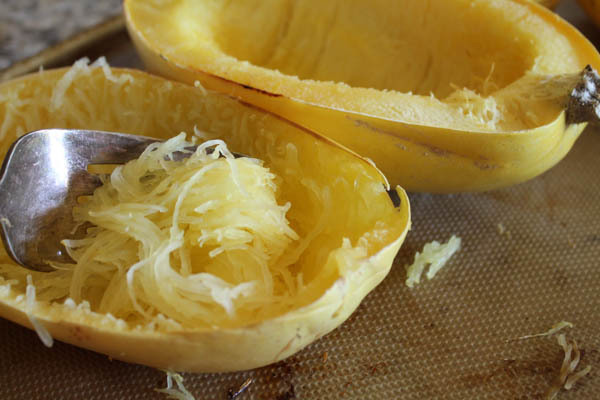 What I found was that spaghetti squash done RIGHT…meaning just tender and al dente…is super yummy in its own right, even if it is not a noodle. Because it is not. But it IS delicious, and satisfying, and a great healthy alternative to heavy pasta dishes. It’s mild flavor pairs well with any flavors you desire, so have fun! The trick is simply NOT to overcook it and turn the shreds into mush. Let me teach you! 1. Preheat oven to 350 degrees. 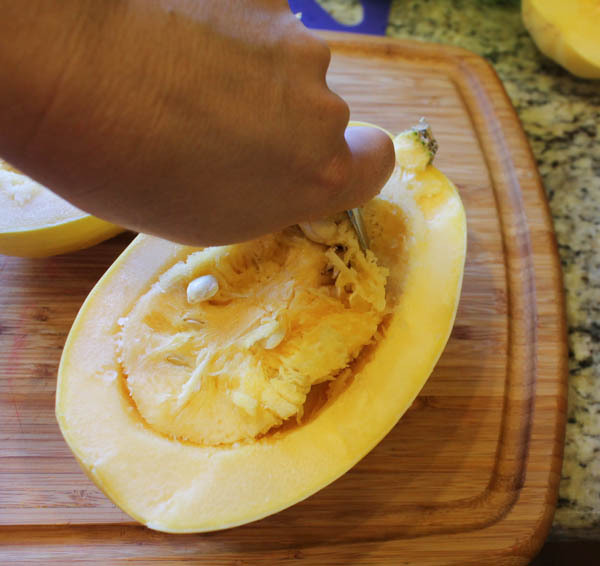 Cut the spaghetti squash in half. Use a strong sturdy knife to do this. I usually score the outside skin with the tip of my knife first so it cooperates more for me. This can take some oompf, be warned! 2. Scoop out all the seeds and pulp with a sturdy metal spoon. 3. 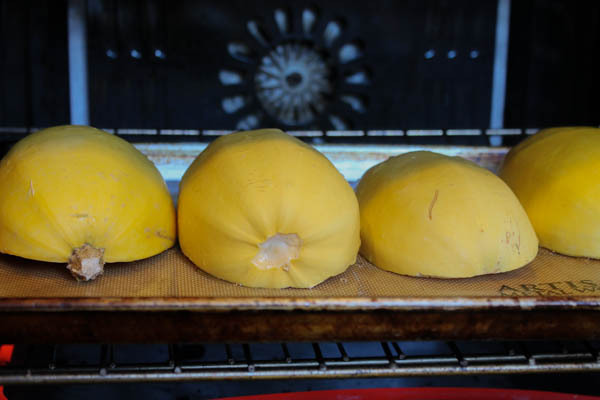 Place squash, cut side down onto a parchment or baking mat lined cookie sheet. 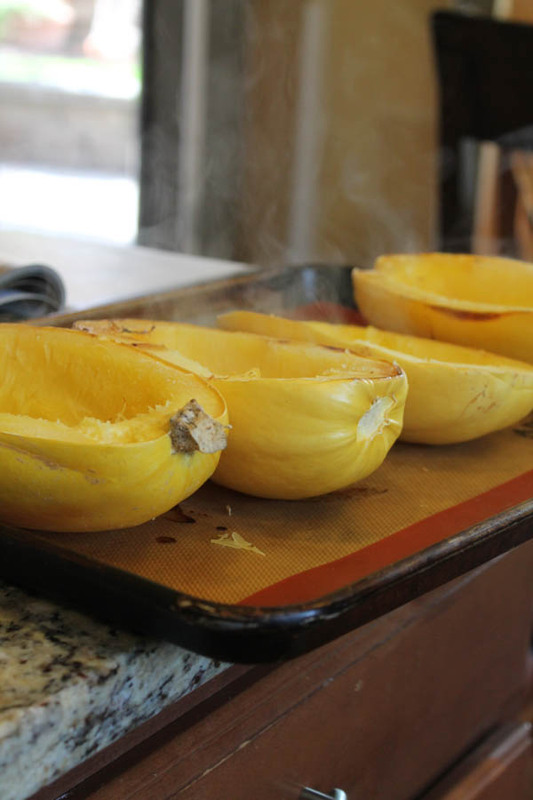 Drizzle about 3-4 tablespoons of water over the top of the squash (about 1 tablespoon per half). Place in the oven and bake for about 30 minutes. The squash should just be starting to give when you touch it, a fork should be able to pierce the flesh. You can also sample a little noodle and decided if it is cooked enough for your tastes. 4. Remove the squash and flip the squash over to cool for shredding. 5. Once cool enough to touch, take a large fork and start shredding, the ‘noodles’ should pull away easily. Your squash is now ready to use! very nice and useful post. 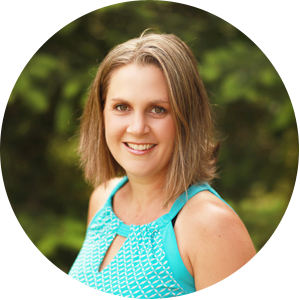 Thanks for sharing with Hearth and soul blog hop. pinning. 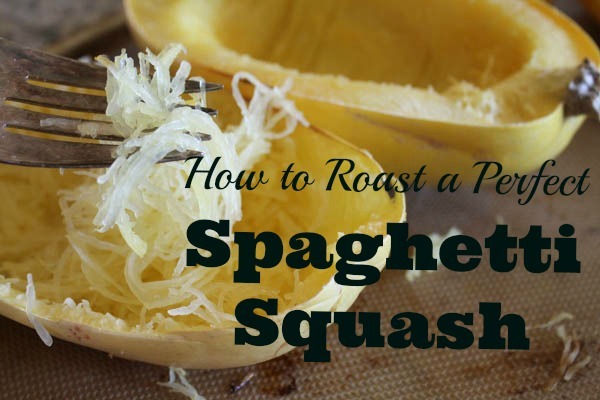 Stopping by from Let’s Get Real link up, and knew I had to thank you for the easy directions for roasting a spaghetti squash. I saw some at the grocery store this week, but passed on them, because I wasn’t sure about how to cook it. So glad that now I know. I love spaghetti squash. Thanks for sharing your simple and easy way to bake them and for sharing on Real Food Fridays. Twitted.